"The Summit Conference" is the 86th Mandrake Sunday story. The story was written by Lee Falk and drawn by Phil Davis. For centuries four planets, eight light-years away from Earth, have battled each other. Now a truce is called between the four planets, and they agree to meet at the third planet of the star called Sol. Then four space ships from alian planets arrive on the neutral planet Earth for a conference to settle their interplanetary wars. Ambassador Glurg, of the Water planet. Ambassador Torn, of the Red planet. Ambassador Tun, of the Great planet. Ambassador Kola, of the Green planet. 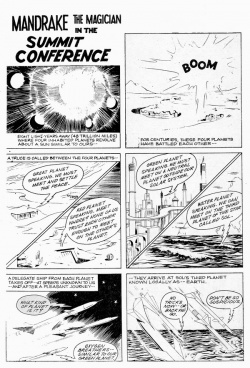 The story title is taken from the strip of February 5, 1961 (Next Week: The Summit Conference).